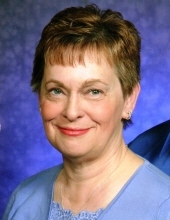 Mary Louise Early, age 71, of Mt. Vernon, Missouri, passed away at 9:54 a.m. on Sunday, November 18, 2018, at the Mercy Hospital in Springfield, Missouri. She was born March 26, 1947, in Pawhuska, Oklahoma, the daughter of the late Donald L. and Mary Evelyn (Woodard) Revert. Mary Lou was a 1966 graduate of the East High School in Wichita, Kansas and she served in the United States Army during the Vietnam Era where she was a registered nurse. She was the owner of the Eye of the Needle in and a member of the Covenant Baptist Church in Mt. Vernon. Mary Lou is survived by her husband of 40 years, William, whom she married on September 16, 1978 in Wichita, Kansas. A memorial service, under the direction of the Fossett-Mosher Funeral Home, in Mt. Vernon, will be held at 2:00 p.m. on Wednesday, November 28, 2018, at the Covenant Baptist Church in Mt. Vernon. Burial will be at a later date at the Missouri Veterans Cemetery in Springfield, Missouri. To plant a tree in memory of Mary Lou Early, please visit our Tribute Store. Convenant Baptist Church, Mt. Vernon, MO. "Email Address" would like to share the life celebration of Mary Lou Early. Click on the "link" to go to share a favorite memory or leave a condolence message for the family.